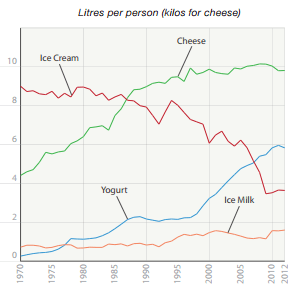 Check out how our food patterns have changed over the years, demonstrated through graphs from Statistics Canada, 2012. 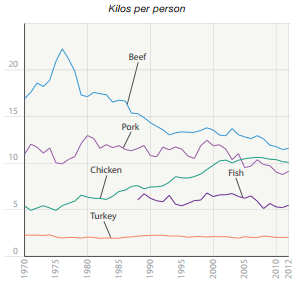 The good news is the beef consumption has dropped, which may cut the risk of heart disease and colon cancer. Unfortunately beef still has a lead on white meat. There is cheese in many popular dishes today – pizza, nachos, quesadillas, salads, sandwiches, ect. It’s important to remember that cheese is a source of saturated fat, which has a negative impact on our arteries and waistlines. Good news is that yogurt consumption is increasing and ice cream is decreasing – however many yogurts nowadays have a good amount of added sugar. 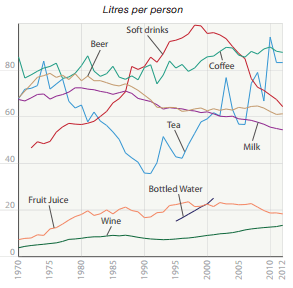 It’s great to see that soft drinks and decreasing and fruit drink consumption isn’t increasing. Tea and coffee are increasing in popularity. However Statistics Canada does not tell us if it’s plain coffee or tea – or a fancy sugar-filled caffeinated drink from starbucks? 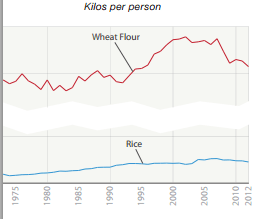 It seems as though wheat flour (aka white flour) is heading down again. The gluten free/low carb movement is likely the cause of this. If only we could switch to whole grains! 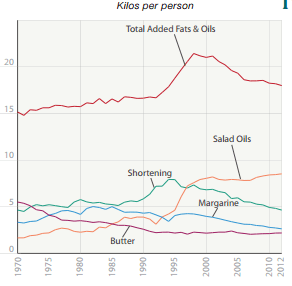 The biggest drop in fats appears to be in shortening, which has more saturated fat than salad oils do, and can also have trans fat. Who needs all of those pies, cakes and cookies that shortening is prevalent in? Horay! 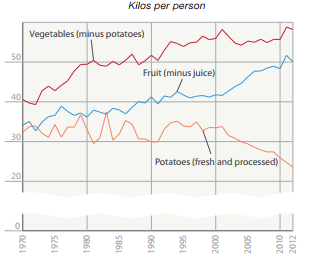 Fruit and vegetable consumption is increasing! We know this is not due to potato consumption, as they continue to steadily decline. There is still room for improvement though – try to include at least one serving of a fruit and vegetable at each meal!